09/06/00 U104. 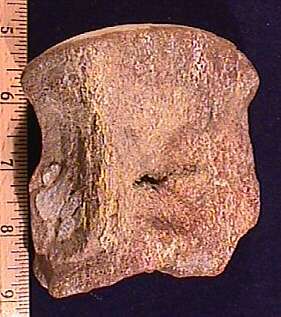 Oceanic reptile vertebra (Mosasaurus sp. ), 2 1/16" X 3", Upper Cretaceous, Navarro Gap., South Sulfer River area, TX, very nice, $40. 09/06/00 U105. 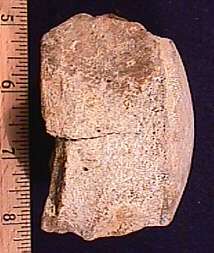 Oceanic reptile vertebra (Mosasaurus sp.) with bite mark, 3 1/2" X 3 3/8", Upper Cretaceous, Navarro Gp., South Sulfer River area, TX, very nice, $45. 08/07/00 U106. SOLD Two Dinosaur toe bones (same animal and toe), 1 9/16" and 1 1/4", Theropod (carnivore), Cretaceous, Tegana Formation, Kem-Kem, Morocco, North Africa, 90 million years old, very rare, $80. 08/07/00 U107. Dinosaur toe bone, 2 1/8", Theropod (carnivore), Cretaceous, Tegana Formation, Kem-Kem, Morocco, North Africa, 90 million years old, $45. 08/07/00 U108. SOLD Dinosaur toe bone, 2 1/8", Theropod (carnivore), Cretaceous, Tegana Formation, Kem-Kem, Morocco, North Africa, 90 million years old, $30. 08/07/00 U109. 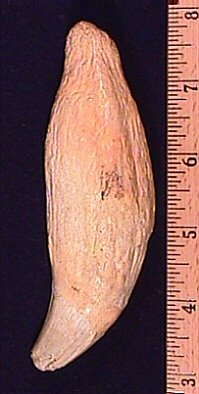 SOLD Dinosaur toe bone, 1 1/8", Theropod (carnivore), Cretaceous, Tegana Formation, Kem-Kem, Morocco, North Africa, 90 million years old, $20. 08/07/00 U110. SOLD Coprolite (fossil dung) from an early mammal, 4", Eocene, Cowlitz Formation, Washington, 45 million years old, Super Specimen!, $35. 08/07/00 U111. SOLD Coprolite (fossil dung) from an early mammal, 3 3/4", Eocene, Cowlitz Formation, Washington, 45 million years old, Super Specimen!, $40. 08/07/00 U112. SOLD Coprolite (fossil dung) from an early mammal, 4 7/8", Eocene, Cowlitz Formation, Washington, 45 million years old, Super Specimen!, $40. 08/07/00 U113. 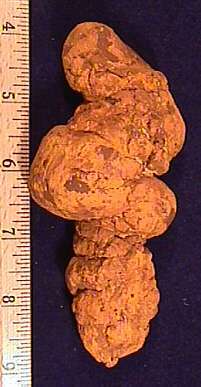 SOLD Coprolite (fossil dung) from an early mammal, 5", Eocene, Cowlitz Formation, Washington, 45 million years old, Super Specimen!, $40. 12/18/99 U114. 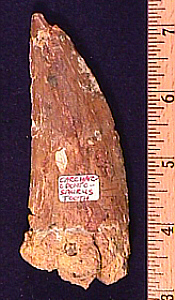 Carcharodontosaurus tooth, 4 1/4", Tegana Formation, Morocco, a nice large uncleaned specimen with some gluing (not unusual), $245. 12/18/99 U115. 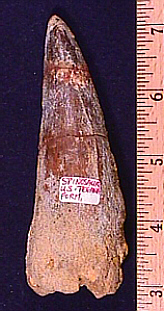 Spinosaurus tooth, 4 1/4", Tegana Formation, Morocco, a nice large uncleaned specimen with some gluing (not unusual), most of the enamel is still there, $190. 12/18/99 U116. Spinosaurus tooth, 4 1/8", Tegana Formation, Morocco, a nice large partially cleaned specimen , beautiful glossy brown enamel, $240. 12/18/99 U118. Dinosaur tooth from an undetermined Theropod, 2 3/8", Tegana formation, Morocco, complete, serrated on both sides, great condition, $120. 12/18/99 U119. 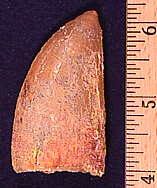 Dinosaur tooth from an undetermined Theropod, 2 1/4", Tegana formation, Morocco, complete, sharply serrated on both sides, enamel in great condition, still in original matrix, $140. 12/18/99 U121. Dinosaur tooth from an undetermined Theropod, 1 7/8", Tegana formation, Morocco, complete, sharply serrated on both sides, enamel in great condition, $95. 12/18/99 U167. Cave bear fang, Urseus Speleus, 4 3/4", Romania, very large example relatively intact piece, huge root, $90.